As the World Economic Forum scrambles to accommodate the additional security measures necessitated by president Donald Trump’s decision to break with presidential tradition and attend Davos this year, the organization has released what’s become an annual tradition: Its report of what it believes are the top global risks for 2018. 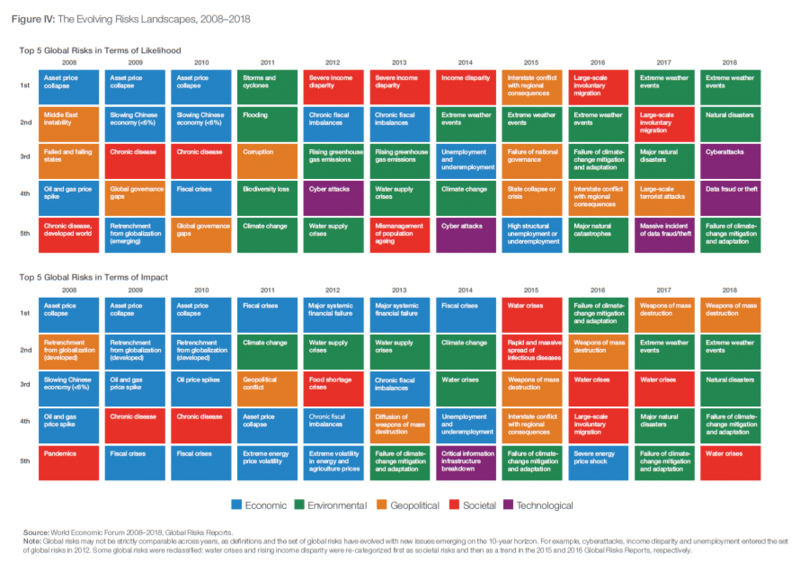 The most prominent theme is the shift in perceived risk factors: conflict and war, natural disasters, extreme weather and cyberattacks have supplanted social polarization and the rise of populism as the biggest global risk for 2018. As the report summarizes, last year’s Global Risks Report was published at a time of heightened global uncertainty and rising popular discontent with the existing political and economic order. The report called for “fundamental reforms to market capitalism” and a rebuilding of solidarity within and between countries. 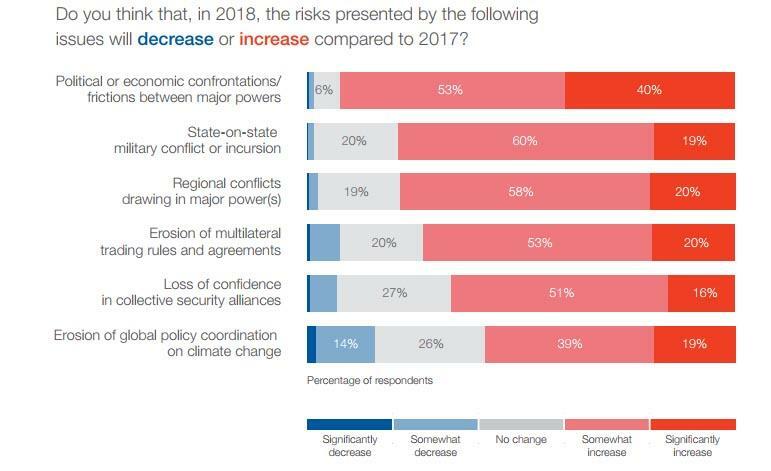 The survey of nearly 1,000 experts from government, business, academia and non-governmental organizations showed 93% expect a worsening of political or economic confrontations between major powers in 2018, including 40% who believe those risks have increased significantly. One year on, the WEF authors notes that the urgency of facing up to these challenges has, if anything, intensified. Economic growth is picking up, but 2017 was a year of widespread uncertainty, instability and fragility—and the latest results of the Global Risks Perception Survey (GRPS) suggest respondents are pessimistic about the year ahead: in a new question gauging expectations for 2018, only 7% of responses point to a reduction of risk, compared with 59% pointing to an increase. The report highlights four concerns: (1) persistent inequality and unfairness, (2) domestic and international political tensions, (3) environmental dangers and (4) cyber vulnerabilities. 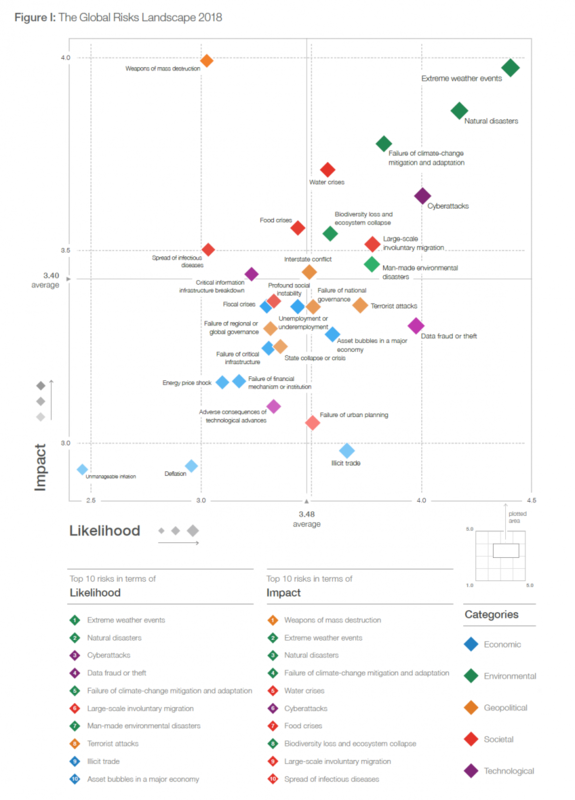 While technological and climate-related risks topped the tables in terms of the most likely risks, Reuters pointed out that perceived risk of a geopolitical crisis - particularly a nuclear one - had also risen after a year of escalating rhetoric between U.S. President Donald Trump and North Korean leader Kim Jong Un that has arguably brought the world closer to a nuclear conflict than it has been in decades. 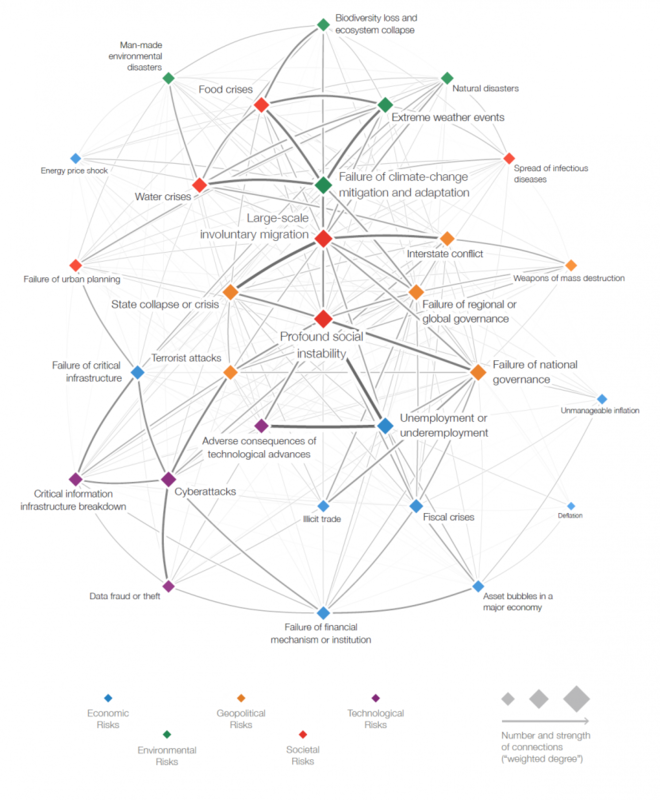 A historical summary of the main risks facing the world according to the WEF. The report notes that some 79% of respondents see a heightened risk of state-on-state military conflict. In addition to the threat of a conflict on the Korean peninsula, the report pointed to the risk of new military confrontations in the Middle East. It cited a rise in “charismatic strongman politics” across the world and said political, economic and environmental risks were being exacerbated by a decline in support for rules-based multilateralism. The report also pointed to Trump’s decisions to withdraw from the Paris climate accord and the TPP trade agreement and his threat to pull out of a deal between Western powers and Iran designed to curb its nuclear program. “The risks we are trying to grapple with here require multilateral solutions but we are moving in the other direction,” said John Drzik, president of global risk and digital at the consultancy Marsh, which helped compile the report. With global growth recovering, concerns about the economy were down sharply. Still, the report described income inequality as a “corrosive problem” in many countries and warned against complacency over the economic environment given high debt levels, low savings rates and inadequate pension provisions. “A widening economic recovery presents us with an opportunity that we cannot afford to squander, to tackle the fractures that we have allowed to weaken the world’s institutions, societies and environment,” said Klaus Schwab, founder and executive chairman of the WEF. And while the report notes the reduced prominence of economic risks, it asks "whether this swing to optimism suggests the possibility of complacency and a developing blind spot around economic risks?" There are certainly reasons to be cautious: one does not have to look far for signs of economic and financial strain. The report suggests that greater attention should be paid to the risks of another crisis erupting. Even without another crisis, economic risks can be hugely disruptive, and last year brought fresh evidence of chronic economic problems, particularly related to earnings and inequality. In its latest Global Wage Report, the International Labour Organization highlighted that worldwide earnings growth has been decelerating since 2012. It called, among other things, for the increased use of collective bargaining to reverse this trend. Meanwhile, even as global inequality is reportedly down, "within-country inequality is an increasingly corrosive problem in many places," the WEF notes. According to the IMF, over the past three decades 53% of countries have seen an increase in income inequality, with this trend particularly pronounced in advanced economies. Furthermore, today’s economic strains are likely to sow the seeds for longer-term problems. High levels of personal debt, coupled with inadequate savings and pension provisions, are one reason to expect that frustrations may deepen in the years ahead. As another WEF chart shows, increasing dependence on cyber infrastructure could lead to a massively disruptive attack or widespread data fraud and identity theft. Meanwhile, the changing climate can lead to food and water shortages and, eventually, the collapse of entire ecosystems. While geopolitical worries rose sharply, the environment topped the list of concerns, with extreme weather events seen as the single most prominent risk in 2018 after a year of unusually frequent Atlantic storms, including Hurricane Maria, which devastated Puerto Rico. Trump is due to give a speech on the closing day of the WEF. The annual event, which takes place at a ski resort in the Swiss Alps, runs from Jan. 23 to Jan. 26 and will attract 70 heads of state and government, as well as celebrities, CEOs and some of the world’s top bankers.